“Life-threatening” Hurricane Florence edged closer to the east coast of the United States Thursday, with tropical-force winds and rain already lashing barrier islands just off the North Carolina mainland. The huge storm weakened to a Category 2 hurricane overnight, but forecasters warned that it still packed a dangerous punch – 110 mile-an-hour (175 kph) winds and torrential rains. Georgia joined four other coastal states issuing an emergency declaration as forecasts showed Florence dumping historic amounts of rain on the southern state. As Florence closed in, President Donald Trump and state and local officials urged residents in the path of the storm to evacuate. The National Hurricane Center (NHC) downgraded Florence to a Category 2 storm from Category 3 on the five-level Saffir-Simpson wind scale, the second such drop in the space of hours. But the Miami-based NHC stressed it remained “a life-threatening situation” due to the risks of storm surge around coastal areas. “Protection of life is the absolute highest priority,” he added. Florence is forecast to dump up to 40 inches (one meter) of rain in some areas after it makes landfall in North and South Carolina Thursday night or Friday. “This rainfall would produce catastrophic flash flooding and significant river flooding,” the NHC said. Life-threatening storm surges of up to 13 feet (four meters) were also forecast in some areas along with the possibility of tornadoes in North Carolina. “This is going to be a Mike Tyson punch to the Carolina coast,” said Jeff Byard, associate administrator for response and recovery at the Federal Emergency Management Agency (FEMA). “This is not going to be a glancing blow,” Byard said, warning of power outages, road closures, infrastructure damage and potential loss of life. As of 8:00 am (1200 GMT), the eye of the storm was 170 miles (275 km) east-southeast of Wilmington, North Carolina, moving northwest at 12 mph (19 kph). A state of emergency has also been declared in the states of Maryland, North Carolina, South Carolina, Virginia and the city of Washington, DC. People fleeing coastal North and South Carolina clogged highways as Florence bore down for a direct hit in the low-lying region dense with beachfront vacation homes. 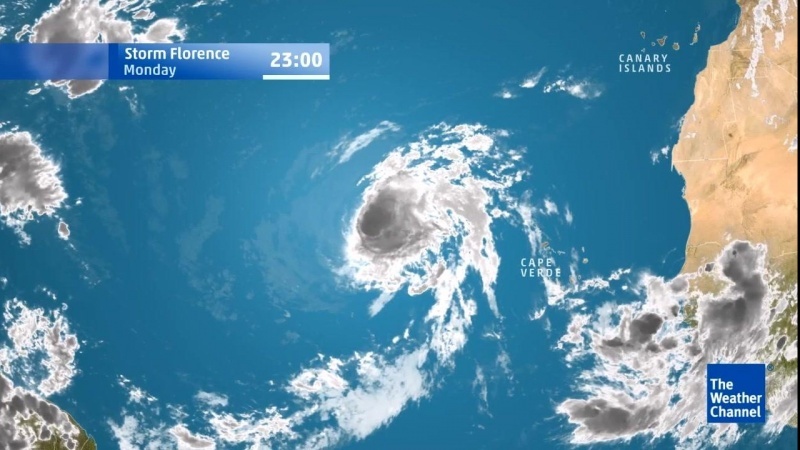 Florence is being trailed in the Atlantic by two other storms – Hurricane Helene and Tropical Storm Isaac.